Small planes are a common way to move around South Sudan, which has few paved roads. Many roads are impassable during rain. Children in South Sudan, one of the world's poorest nations, sit in front of traditional homes made of mud and thatch. 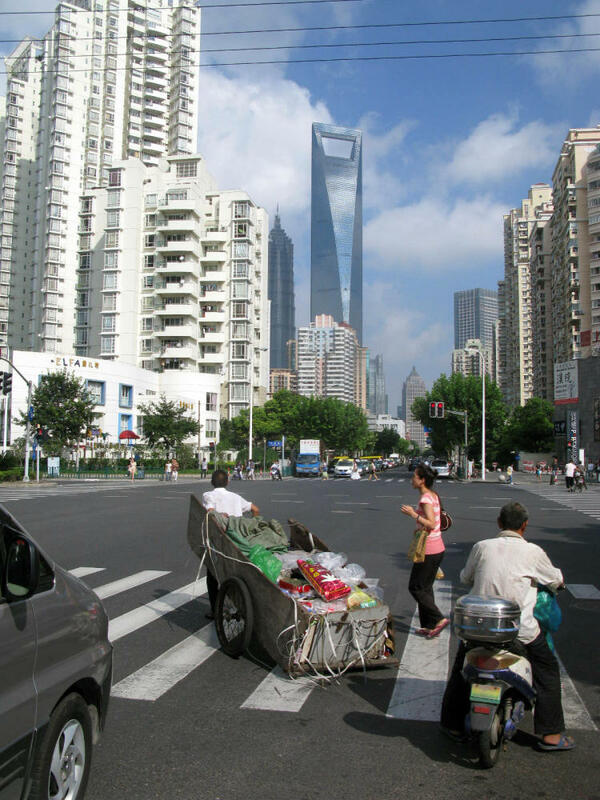 Despite its ultra-modern skyscrapers and paved streets, some Shanghai residents still transport items on carts. NPR's Frank Langfitt has spent the past year reporting in two countries where the populations and the problems could not be more different: South Sudan and China. 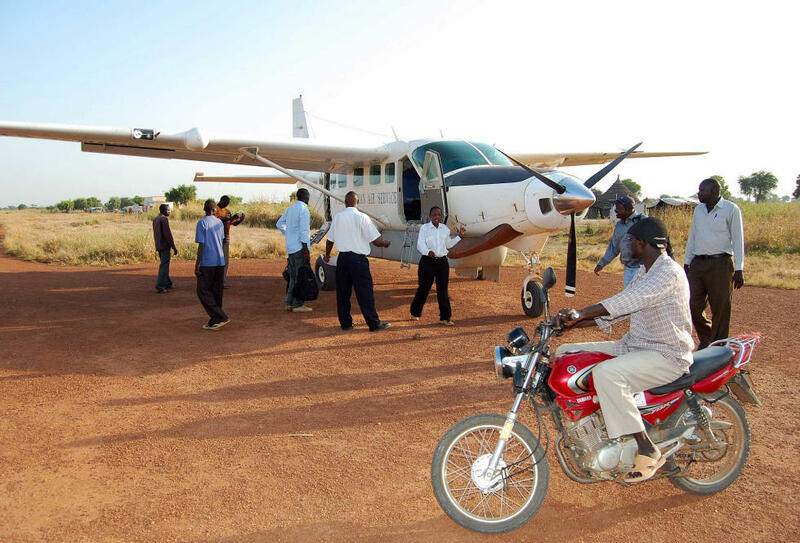 The best way to travel in South Sudan is by plane. That's because, in a nation nearly the size of Texas, there are hardly any paved roads. Earlier this year, I flew to Akobo County, near the Ethiopian border. On the hour-plus flight, I saw cattle herders and acacia trees, but mostly empty landscape. There was little sign of the 21st century — or the 20th. I touched down on a dirt runway in a town of mud and thatched huts. Goi Jooyul Yol, the county commissioner, explained how the lack of infrastructure is holding his people back. "Akobo is a county that is cut off from the rest of Southern Sudan," he said. "The only way we reach other counties through the state is through the river. We have a seasonal road right now. As soon it starts raining, everything stops." South Sudan is the world's newest nation and one of its poorest. Its success depends in part on whether it can build enough roads where few exist. Without tarmac roads, the people of Akobo can't sell their corn and sorghum to outside markets. So, most of its residents remain subsistence farmers or cattle herders, leaving the government with little way to raise revenue and pay for anything. "The operating cost in the county, we cannot make it," Yol says, "but we do have a lot of potential." The population of sub-Saharan Africa is growing faster than any other region on Earth. South Sudan has more than 8 million people, and it's been growing in recent years for reasons beyond its fertility rate: Hundreds of thousands of refugees from Sudan's civil war have returned home. Akobo's schools can't handle the students they already have. The current class size is 200 to 300. "Some of them don't fit in the classroom," Yol says. "They sit under the tree. When I heard it first, I didn't believe it. But when I went and saw it, it is something mind-boggling." China is mind-boggling in a completely different way. While South Sudan has very little infrastructure, China has built more infrastructure in recent years than any other country. Some Chinese, though, fear the expansion has been too expensive and too fast. 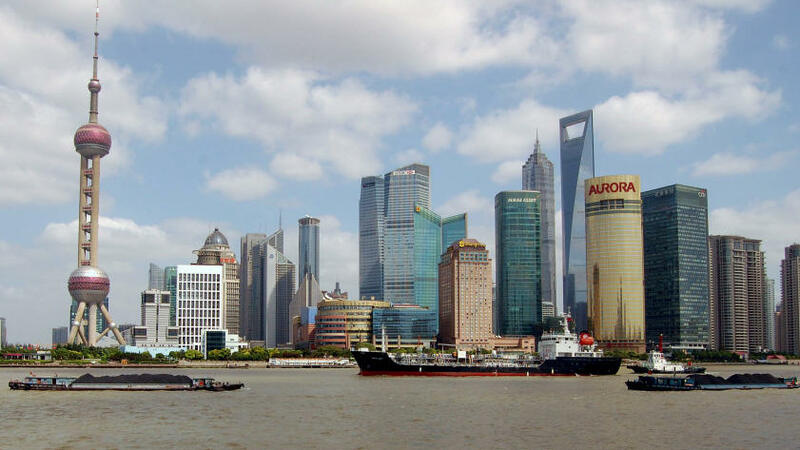 China is the world's most populous country with 1.3 billion people. Most of them are crammed along the country's East Coast. You could walk for miles through the Sudanese bush and never see another soul. But in Shanghai, you sometimes have to walk on the street because there's no room on the sidewalks. China has slowed population growth by limiting urban families to one child. Its challenge is moving the mass of people it already has quickly and efficiently. China came up with one answer nearly a decade ago: a magnetic levitation train to one of Shanghai's international airports. The train glides along a rail and covers about 19 miles in around eight minutes. But few people actually use the train. One passenger, a businessman surnamed Pan from East China's Shandong Province, explained why. "The train ticket is expensive, $6," he said. "You have the subway, it's cheaper. For less than a dollar, you can get to your destination." The Chinese government spent more than $1 billion building Mag-Lev, as it's known, in 2002. Last year, the train ran at just 20 percent of capacity. Unlike South Sudan, China has huge financial resources, but the lesson of Mag-Lev is this: You don't just need money to handle a large population. You need to be careful where you spend it. China is now focused on building a huge network of high-speed trains. Chinese rail travel has often been a slow, crowded ordeal, but the bullet trains are changing that. Zheng Zhongyu, an acting student in Shanghai, says trips to Beijing are so much better these days. "Before the train took 13 hours, now it's five hours," says Zheng, waiting outside the Shanghai Railway Station. "When I would take the train home, I couldn't buy tickets. I'd have to stand the whole night. Now, buying tickets is very convenient." But last summer, two bullet trains collided, killing 40 people. The government blamed a lightning strike, but delayed releasing a report. The crash left many Chinese uneasy. Some feel their government is building too much infrastructure too fast, because it can. Back in South Sudan's Akobo County, a problem like that is unimaginable and the needs of the population more basic. What Akobo requires — and is in the process of getting — is just a road people can drive on in the rain. And let's define what we mean when we say the planet has gotten crowded. You actually could fit seven billion people on a single island with room to spare, but of course that's not how people want to live. To support seven billion people, you need a lot of infrastructure, things like roads, railways, schools. NPR's Frank Langfitt has spent the last year reporting in two countries where the populations and the infrastructure problems could not be more different: South Sudan and China. FRANK LANGFITT, BYLINE: The best way to travel in this East African country is by plane. That's because, in a nation nearly the size of Texas, there are hardly any paved roads. Earlier this year, I flew to Akobo County, near the Ethiopian border. On the hour-plus flight, I saw cattle herders and acacia trees, but mostly empty landscape. There was little sign of the 21st century - or the 20th. LANGFITT: I touched down on a dirt runway in a town of mud and thatched huts called tukels. Goi Jooyul Yol, the county commissioner, explained how the lack of infrastructure is holding his people back. GOI JOOYUL YOL: Akobo is a county that is cut off from the rest of Southern Sudan. The only means that we reach other states is through the river. LANGFITT: Do you mean you can't actually drive here? YOL: In the next few days, we will start driving. You know, we have a seasonal road right now. As soon it starts raining, everything stops. LANGFITT: Without tarmacked roads, people can't sell their corn and sorghum to outside markets. So most of its residents remain subsistence farmers or cattle herders. That leaves the government with little way to raise revenue or pay for anything. YOL: Our operating costs here in the county, we cannot make it, but we do have a lot of potential. If we have two roads open from Pochala to here and one to Bor, we are looking forward to make at least 20 percent in the first year, 20 percent of the budget. But right now we cannot even make two percent. LANGFITT: The population of sub-Saharan Africa is growing faster than any other region on Earth. South Sudan has more than eight million people, and it's been growing in recent years for reasons beyond its fertility rate. Hundreds of thousands of refugees from Sudan's civil war have returned home. Akobo's schools can't handle the students they already have. Yol says the current class size is huge. YOL: Two hundred to three hundred children. Some of them don't fit in the classroom. They sit under the tree. When I heard it first, I didn't believe it. But when I went and saw it, it is something mind-boggling. LANGFITT: China's mind-boggling in a completely different way. It's the world's most populous country, with 1.3 billion people. Most of them are crammed here along the country's east coast. You can walk for miles through the Sudanese bush and never see another soul. But here in Shanghai, you sometimes have to walk on the street because there's no room on the sidewalks. China slowed population growth by limiting urban families to one child. Its challenge is moving the mass of people it already has quickly and efficiently. UNIDENTIFIED WOMAN: Dear passengers, welcome to take Shanghai Maglev train. LANGFITT: One answer is Shanghai's magnetic levitation train to the airport. I'm on it right now, and it's an engineering marvel. It covers about 19 miles in around eight minutes. But the weird thing is there's hardly anybody on it - maybe a dozen people in the car with me right now. So I asked a passenger, a businessman surnamed Pan, why more people more people don't take Maglev. PAN LUEHE: (Through translator) The train ticket is expensive - six bucks. If you have the subway, it's cheaper. For less than a dollar, you can get to your destination. LANGFITT: Unlike South Sudan, China has huge financial resources. It spent more than a billion dollars building Maglev in 2002. But last year the line ran at just 20 percent of capacity. The lesson: You don't just need money to handle a large population. You need to be very careful where you spend it. China's government is now focused on building a huge network of high-speed trains. Rail travel here has often been a slow, crowded ordeal, but bullet trains are changing that. Zheng Zhongyu is an acting student in Shanghai. He says trips to Beijing are so much better these days. ZHENG ZHONGYU: (Through translator) Before the train took 13 hours; now it's five hours. When I would take the train home, I couldn't buy tickets. I'd have to stand the whole night. Now buying tickets is very convenient. LANGFITT: But last summer, two bullet trains collided, killing 40 people. The accident left many Chinese uneasy. Some feel their government is building too much infrastructure too fast, because it can. Back in South Sudan's Akobo County, a problem like that is unimaginable and needs of the population are more basic. What Akobo requires, and is in the process of getting, is a road people can drive on in the rain. Frank Langfitt, NPR News, Shanghai. Transcript provided by NPR, Copyright NPR.